Referee Tony Weeks stops the fight as Jaime Munguia of Mexico scores a TKO victory over Brandon Cook of Canada. A game but vastly overmatched Brandon Cook of Canada suffered a TKO loss in the third round of his junior middleweight championship fight Saturday in Las Vegas against 21-year-old Jaime Munguia of Mexico. Cook came in as a heavy underdog. 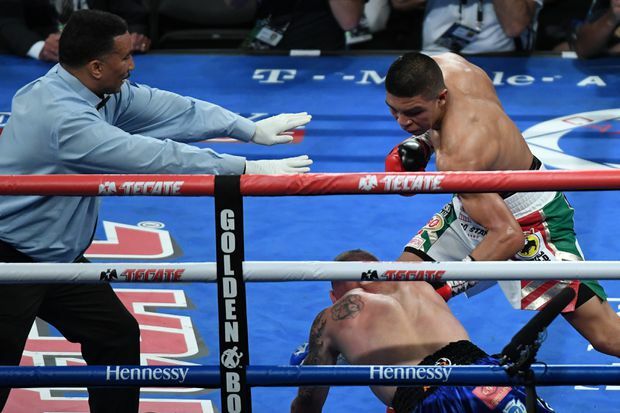 Munguia landed more than three times the punches of his opponent, focusing on the body. He dropped Cook (20-2, 13 KOs) with a body shot in Round 3 and continued with his attack along the ropes until referee Tony Weeks jumped in to end the fight.